Doesn't it seem like I have been reviewing a lot of mascaras lately? Well, I will tell you why. While I generally tend to hold on to makeup for way longer than I should, mascara is an item that I frequently replace. Mascaras are notorious breeding grounds for bacteria. Also, My eyes are extremely sensitive. So, I want to make sure that my mascaras are nice and fresh! So, I stay on the safe-side and toss them often. I would probably say that I use a mascara for the maximum of about 2 months. Therefore, I rarely (if ever) purchase high-end mascaras. That would just be too costly. I almost always go for BOGO deals at the drugstore combined with manufacturer's coupons. If I see a good deal on one of my fav mascaras, I grab it as I know I will need to replace whatever I am using soon. So, always be on the watch for those sales ya'll!!! Okay, I digress! As ya'll know, my HG mascara is Cover Girl's Lash Blast Fusion (and I am a general fan of all the Lash Blast formulas). No matter whatever other mascara I am testing, I always have this great one on hand! To see my previous review, please click here. 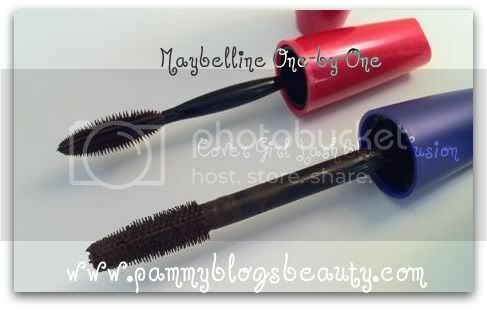 But this review today is for the Maybelline Volum'Express One by One Mascara. How do they compare? For what I look for in a mascara, my review, etc please keep on reading! It must be smudge-free! I can't stress this enough!!! Most mascaras smudge *terribly* on me. This is usually single biggest deciding factor on a mascara. I mean, it could do wonders for my lashes, but if it smudges, then I won't ever wear it. Volume and Length: Yes, I am looking for both! I have sparse, blonde, and short lashes. So, I need all the help I can get! Clump free: I want to get nice separation of the lashes with minimal "work" and no clumping. Brush preferences: I generally prefer the "rubberized" brush heads over the spooly/bristle style brushes. Otherwise, I just generally prefer a large brush head. The bigger the better. Just a preference. 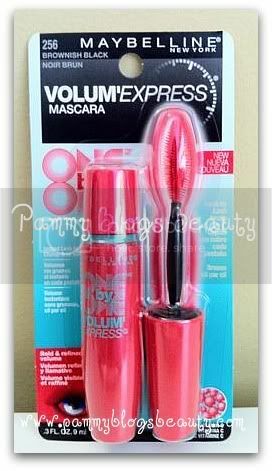 Now, on the the review for Maybelline Volum'Express One by One Mascara!!! Well, with my affinity for rubberized mascara brush heads, I immediately that I would need to test out this mascara! Even at first glance of the package, I could tell that this was "Maybelline's Version" of the Cover Girl Lash Blast mascara. The rubberized head and the fat/colorful tube really remind me of Lash Blast. Plus this package promised "Instant Lash-by-Lash Clump-free volume"! I purchased this in the color Brownish Black (non-waterproof formula). It was about $6. I am not sure if Brown is available as it wasn't displayed. But, being blonde, that would be my first choice for color for an every-day mascara. This is nice as an "every day" mascara. You won't get "drama" lashes with this one. It gives you some volume, but no major lenght. But, for everyday, I think it does a great job at defining your lashes. I love the brush!!! This rubberized/plastic brush head works wonders to separate your lashes while you apply! I find the application to be easy and quick. You will be left with separated lashes. No further need to comb or separate. 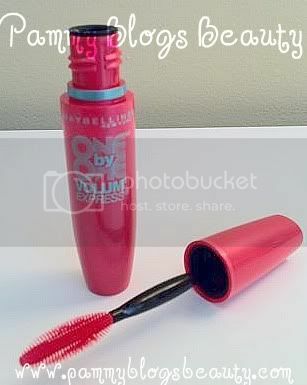 So, this is a great mascara to use if you are in a hurry! Easy-peasy! I had *no smudging* or transfer to the under eye area with this mascara!!! Yay!!!! This is a MAJOR FEAT as so many formulas smudge on me. But, nope, not this one!!! Yay!!! Again, this makes it great for every-day use!!! 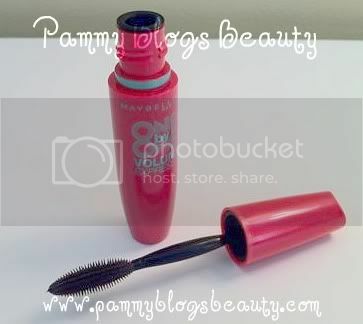 This mascara retains a curl very well! My lashes are super-straight and I use an eyelash curler to curl them before applying mascara. My lashes kept the bend or curl all day with this mascara. Great!!! If you want massively dramatic lashes, you won't get that with this mascara. You can build up a few coats though and it will remain clump free. The verdict: I really love this mascara for every day use!!! Do I like it as much as Cover Girl Lash Blast Fushion, well, not quite, but I do like it! I prefer the larger brush on the Lash Blast Fusion. This Maybelline Volum'Express One by One mascara is great for an everyday mascara for natural looking defined lashes as it is quick and easy to apply, does not clump, and does not smudge! All the "basics" are covered! I will continue to enjoy using this mascara, and might even repurchase! While it doesn't deliver much as far as length, it is so suitable for day-to-day use! I hope you enjoyed reading this review! Have you tried this mascara? How did it work for you? If not, what are your fav mascaras? I am always up for trying a new one!!! Alright, alright I'll try it ;-). Maybelline is 40% off at Walgreens anyway! LOL...do it Wendy!!! I am such an enabler!!! But, seriously? Great sale! I have to hit that too!!! xoxo! Hey Joann!!! Yes, us girls with the short/sparse/straight lashes need to stick together!!! Volumizing mascaras are exactly what we need! xoxo! i *need* to try CG Lash Blast now! have heard so many people raving about it!